Some merchandise will only be available online, so if you like it, buy it. Our online merchandise store will go live on April 15th, 2019. When you register, you will have the opportunity to order and purchase any of the available items we have. Some items will only be available online. Items ordered online can be picked up at the merchandise booth starting Sunday, June 23rd. We are happy to announce that next year Anaheim Firefighter's will be hosting the Summer Games, July 12-17, 2020. Host hotel will be the Sheraton Anaheim 1855 S. Harbor Blvd. https://www.marriott.com/hotels/travel/snaps-sheraton-park-hotel-at-the-anaheim-resort/ For more info, see the Anaheim Firefighters booth at check-in the week of June 23rd, 2019. 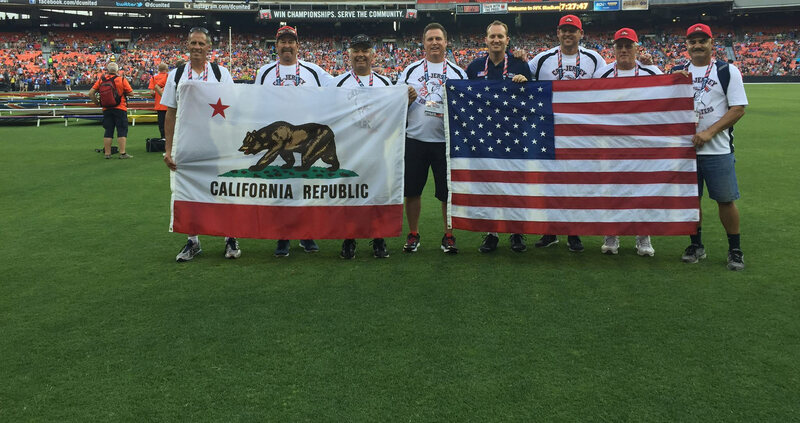 California Firefighter Summer Games shared a memory. This years Over The line Tournament will be featured June 24 2019. Co-ed (At least one female) 4 Person Maximum Roster For individuals interested in playing Over the Line, refer to the Player Pool information. Any player 60 years old and over can use a glove when on defense. Bats & Balls will be provided at the event. California Firefighters Summer Games Registration will open tonight April 15th, 2019 at midnight. This year we will initiate on-line sales of merchandise with a 10% discount. Certain items will only be available on line. Check them out at www.cfaa.org/ You can make purchases when you register and pick it up at check-in. There will still be sales at check-in. Some new events to look for: Water skiing and Olympic Weightlifting. For Hotel reservations, choose registration from the Home Page and then click lodging. It will take you to the Hotel web site. Wakeboarding/Water skiing is a go, we are planning the event as of 01/23/2019. Please get the word out. HOSPITALITY – SUNDAY, MONDAY, TUESDAY, WEDNESDAY AND THURSDAY EVENINGS, POOLSIDE. The Firefighter Summer Games began in 1970 as an opportunity for all California Firefighters to get together in friendly competition which promotes physical fitness and provides an informal forum for exchanging ideas. Throughout the years, the Summer Games have been held in Oakland, San Francisco, Los Angeles, Davis, Irvine, Santa Clara, San Jose, San Diego, Palo Alto, Bakersfield, Santa Ana, Ventura, Concord, Sacramento and Livermore/Pleasanton. The games are governed by the California Firemen’s Athletic Association, with a local association bidding to be the host and bring the games to their community. For 2019, the California Firemen’s Athletic Association (CFAA) has decided to stay in San Diego California. The Games consist of several areas of competition which are all included in the events section of this web site.